Country-house, 3 Bedrooms + Guesthouse, 1 Bathroom, Fireplaces. Villa Drottningholm is a beautiful old house from the 17th century, stunningly located close to a horsefarm and the forest right outside with a perfect recreation area. The house is fully modern, carefully restored in a light, country, scandinavian style. It has it´s nice private ground, a newly renovated guesthouse with 2 single beds and a terrace. The property offers complete privacy. The bottomfloor consists of a livingroom with a fireplace, a large kitchen with complete equipment and a fireplace, and a laundryroom. The second floor has a TV-room, three bedrooms one with a kingsize bed, the others with a singlebed in each. A balcony with view over the horse meadow. There is also a nice bathroom with a yaccutzi. Outside in the garden there is a sauna which you heat with firewood. There is a smaller house fulltime rented on the property. They have their own garden and are very quiet, you will hardly take any notice of them. Communications: Lovö church is 10 min. walk from Villa Drottningholm, from where the buses take you to Brommaplan (Metrostation) Driving a car will take 20 min,unless you choose the busy early morning traffic, between 7-8 am. A more beautiful way to go to the city is taking the classical steamboat leaving from the royal castle of Drottningholm. Takes 45 min. The castle where the royal family lives, is a must to visit itself. The fantastic garden is a popular target for picnics during the summer. Lovö/Drottningholm is an island sorounded by lake Mälaren. You can rent a boat, but it´s best to be arranged in advance. Weather: Sweden has far lot better weather than it´s rumor. May, June, July and August hare the most stabil months to enjoy the country. The evenings are light, the sun rices extremely early and sets very late. Temp, around 20-25 C. Atumn is during sep-nov with clear skyes and beatiful colours. Dec-feb we will hopefully have snow, since we love celebrating a white Christmas. It is very cosy, especially in our oldfashioned house. We go countryskiing a lot, just outside the door. When spring comes we sit outside as much as we can, enjoying the light and the sun, the barbeque-season starts and is one of the most popular way of socializing in Sweden. We are a couple with two grown-up children, we run our own business and love to travel, enjoy the nature of our country are interested especially in boats and lake/sea activities. Our main concern is the family and our cat 'Morrgan Stanley'. The unique benefit of this property is the close distance to the city of Stockholm, and still this is a country area. Our neighboors are farmers. Less than 30 minutues we will reach Stockholm, less than 15 min. walk we will find a private place to swim from, or pick mushrooms or blueberrys. And you can walk to the golfcourse. Beautiful villa and very hospitable owners! We spent a wonderful week in this fantastic house. The owners were very welcoming and were always happy to answer any questions we had. The house is beautiful inside and contains everything you could possibly need. It is only a 20 minute walk to the edge of the lake where you can swim and just a short drive into Stockholm and the surrounding areas. I would highly recommend this property. This is a beautiful Swedish House with wonderful hosts in a very scenic and special place. Imagine waking up to a deer outside your window, then walking to a lake for a private swim, then a thirty-minute,easy bike ride past Drottningholm Castle to a metro station where in 15 minutes you will be in the heart of Stockholm. If you don’t have a Swedish cousin that can loan you a bike for a week, you can rent one, or you can walk to a bus stop that can take you where you need to go. At Drottningholm you can even take a ferry to Stockholm. If you like golf or just like having a pear cider while you watch golfers, there is a beautiful golf course close by. The house is tucked away at the edge of the woods, behind a riding stable, so you really feel like you are in the country yet you are very close to a world class city. I had a Fourth of July Dinner Party for 8, and the well-organized kitchen had everything I needed. I was traveling without a car so the day I arrived, Britt met me at the Metro and drove me to the house after waiting for me to do a little shopping. I highly recommended this house to woman traveling alone, a family with children who would love the little red playhouse in the yard, or a couple who wants a romantic adventure. Be sure to take the wooden bike tour and the kayak tour of Stockholm. We had a great time with our children in this - in every detail fully equiped - house. The place is quiet, near to the forest an the beautiful Mälaren (20 min walking distance). Stockholm by car or bus is very esay to reach. The house with its elegant furniture is an eyecatcher for itself. We can highly recommend Britt and her house. Choose it if you want what we were looking for: A quite lovely place to relax and on the other hand just jump into your car and get into the heart of Stockholm. Wir hatten eine tolle Woche in einem sehr liebevoll gestalteten Haus. Zum Baden sind wir jeden Tag durch den für die Kinder abenteuerlichen Wald gelaufen. Anscheinend haben wir den schnellsten Weg nicht gefunden - wir haben ca. eine halbe Stunde gebraucht. Dafür würde man aber auch mit einem wunderschönen Schwimmerlebnis belohnt. Der Weg in die Innenstadt war gut machbar, so dass wir auch die Sehenswürdigkeiten von Stockholm genießen konnten. Insgesamt ein gelungener Urlaub! Very friendly owners. A wonderful property, clean and very nice. Beautifully located in the countryside but also close to the City. We totally recommend to stay there! 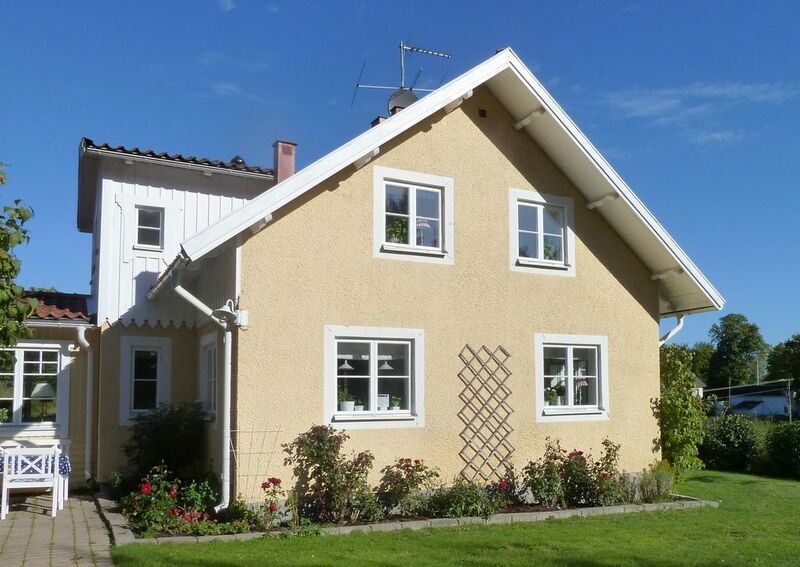 The property is located in a wonderful countryside area, where you can combine the quietness and farmers neighbourhoods with a city vacation in beautiful Stockholm. The royal castle where the royal family lives is close, a must to make a visit, both in the castle and in the popular picnic-park. Ferrys will take you in to the city, a beautiful trip on a steamboat. Our house is old, from the 1700 th century but completely renovated and modern in an old style. Outside the garden of the property you will find ancient monuments, the area leaves historic tracks of heritage, if you will examine even more, go to Birka, the heritage from 700th century, the centre of the Vikings in Scandianvia. Located on small island in lake Mälaren, called Björkö. You will reach it by boat. Right outside the house there is a beautiful forest for hiking or to make a walk to the lake Mälaren, easy to find your private place to swim from. It is walkingdistance to the golf course, renting a boat is a good idea. But last, the city of Stockholm is close.